sunny (sundew) crowley on Hello World! (‘til Tuesday) – Tales & Flukes from LIFE IN THE TREES depicts life at its flukiest. 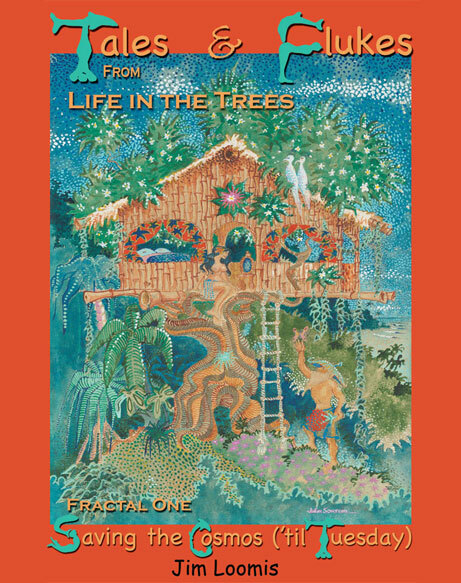 Each book is conceived as a fractal of the whole; all are inspired by the author’s colorful life. Fractals Two, Three and Four will be published soon. Jim takes us from his earliest impressions that led him to science and mathematics to living in nature and environmental activism. With humor and unabashed bravura, he brings us to his unique view of the post-modern, post-bankster world. To read some excerpts… Click Here! Just can’t wait to get your hands on the book? Click the button!